Hey y'all! Happy Sunday, everyone. If you have not yet heard about the butter glosses, then you must be living under a rock. Well, I suppose same applies to me because I did not try these myself until this past March. NYX Butter Gloss is a well-liked product. Since the end of last year, I have become quite adventurous with makeup and experimented with different brands and a broader range of colors. After reading and hearing positive reviews of NYX products, I decided to purchase a few of the NYX Butter Glosses when NYX released a few new shades. 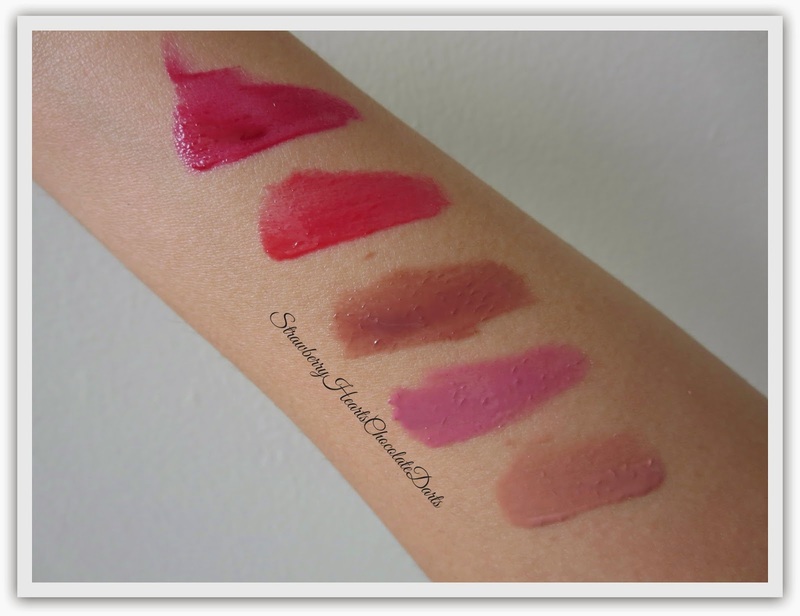 The original line of NYX Butter Glosses were released a couple of years ago and recently they released more shades, which offer richer pigmentation than the original ones. All of the shades mentioned below, except for Cherry Pie, are newly released shades. NYX Butter Glosses are affordably priced at about $4.99 and can cost even less if you purchase them during a sale. NYX cosmetics are sold online on the company's website and at all ULTA stores. Some CVS and Target stores are now also carrying this brand. So, now that I have tried out the NYX Butter Glosses myself, do I agree with the other beauty bloggers? 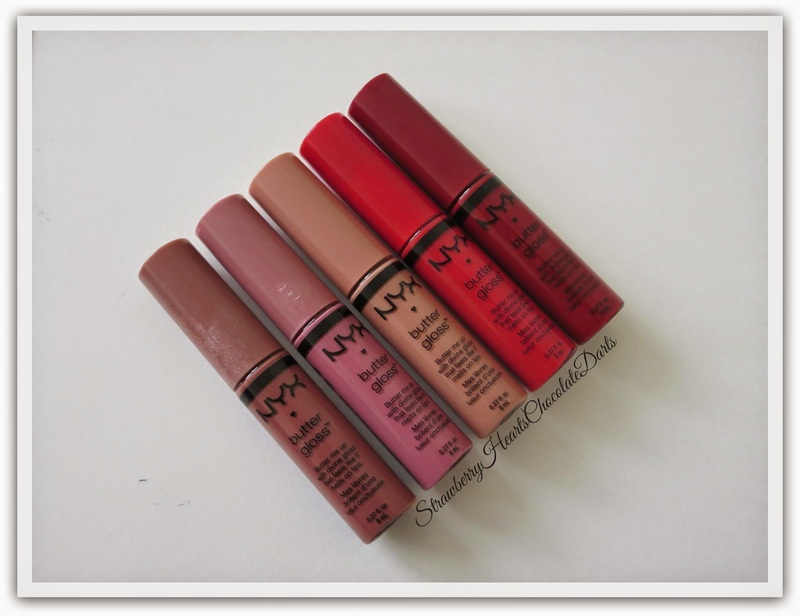 Are NYX Butter Glosses worth the hype? Yes! The NYX Butter Glosses exude the aroma of a bakery - fresh out of the oven vanilla cupcakes. The pigmentation varies from shade to shade, but overall is excellent. One of the reasons I dislike glosses and prefer glossy lipsticks or liquid lipsticks is because generally glosses do not provide rich pigmentation. NYX Butter Glosses are an exception as demonstrated by the picture above. It is very disappointing when brands release a massive collection of glosses in 20 different shades, but once you apply the shades, there is weak to absolutely no color pay off. Lastly, I like the formula and texture of this product. This gloss is unlike most glosses that I have tried. It does not feel sticky, tacky, or heavy. It pairs well with a lipstick worn underneath and does not drag the base color away. Again, it is pigmented enough that it does not have to be paired with a lipstick underneath. The staying power is obviously mediocre, but not poor, because this is not a sticky gloss. This gloss feels luxurious, lightweight, smooth, but not slippery, and does not dry (or "exfoliate") your lips as some sticky glosses tend to do. Although I love red, orange, and other bright shades, at heart I am most drawn to neutral shades, so Praline, Angel Food Cake, and Madeleine are my favorite shades. So glad you like these! I see a few here that I have to pick up! My all time favorite of these is Creme Brulee. I think I have like 2 backups just in case haha! Butter glosses are one of my favorites from NYX! I love these glosses! angel food cake is one of my favorites! I couldn't agree more, these are my fave glosses! Love the look of Praline & Angel Food Cake!